14 | Register for recreation programs online at rentonwa.gov/cybersignup Transportation Home Repair The City of Renton Human Ser vices Program offers a variety of home repairs at no cost for eligible residents who live within the City of Renton. If you need a repair, please call Human Services at 425-430-6600. The Budkis Memorial Fund Mij and Chuck Charbonneau lost their beloved English Bulldog, "Budkis", to an inoperable tumor. In Budkis' absence, Chuck and Mij provide funding to assist low-income senior citizens with emer- gency pet care needs. Contact your local veterinarian. Community Living Connections We are a network of advocates for people facing aging or disability issues. Older adults, adults with disabilities, caregiv- ers, family members, and professionals can call us to get objective, confidential information about community resources and service options. Call 206-962-8467 or email info@communitylivingconnections.org. Our website is communitylivingconnections.org. Senior Pet Food Program Through the Humane Society's Senior Pet Food Program, free pet food will be delivered to the Renton Senior Activity Center for pick up. For information on this program, call 425-430-6633. 211 Community Resources Line You can dial 2-1-1 from any landline in King County to receive information from a referral specialist on a wide range of community services in King County. Reduced Utility Rates and Utility Tax Rebate The City of Renton offers reduced rates for low-income senior citizens (61 and over), and low-income disabled citizens. Applications are at the Renton Senior Activity Center or the Utility Billing Customer Service counter in Renton City Hall. Special Services Handicapped Parking Disabled persons may obtain a parking sticker by submitting a physician's cer- tificate to a local vehicle licensing office. Forms are available at the reception desk. King County Metro Orca Card If you are a senior citizen 65 years or older, you can receive a Regional Reduced Fare Permit for three dollars ($3) at the Renton Senior Activity Center on April 18 and June 20, 11:00 am–12:00 pm. Volunteer Transportation Qualified volunteer drivers provide rides to medical appointments and other essential services. To qualify for transpor- tation, you need to be 60 years or older, a King County resident, and have no other transportation options available. For information, call Volunteer Transportation for Seniors at 206-448-5740, between 8:00 am and 3:00 pm. Hyde Shuttle The Hyde Shuttle offers free door-to-door service throughout the Renton city limits for seniors 55 years of age and older and people with disabilities of all ages. They provide transportation to the Renton Senior Activity Center, grocery stores, libraries, banks, to visit a friend, cultural and social activities, medical appoint- ments, and local errands. 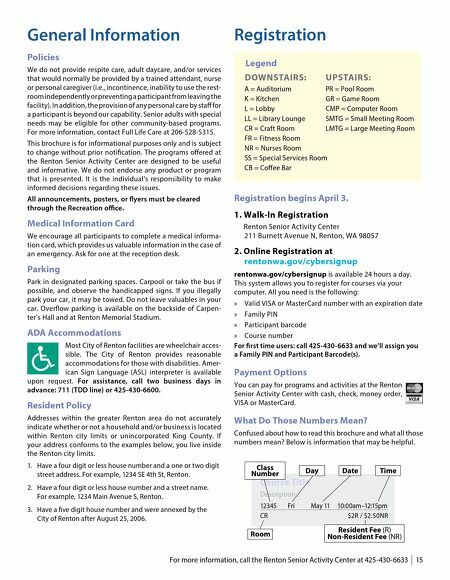 Register for service by phone. There is no applica- tion or in-person eligibility screening. Riders may request ser vice up to 30 days in advance and same day service on a space available basis. The shuttles are equipped for people who have dif- ficulty using stairs or use a mobility aid. Hours of operation are Monday through Friday, 8:00 am–4:00pm. Shuttles are free, although donations are welcomed. To request a ride, or for more information, call 206-727-6262 or visit soundgenerations.org. 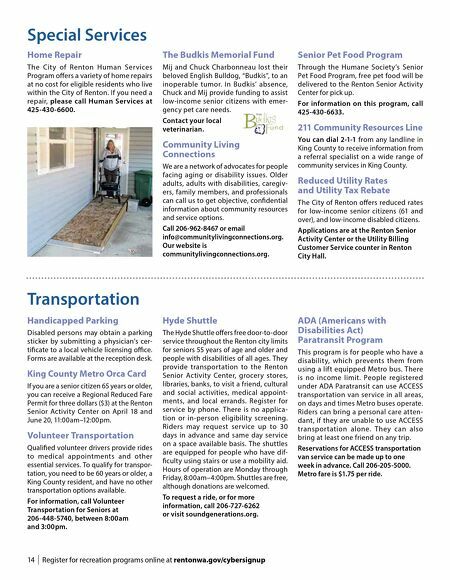 ADA (Americans with Disabilities Act) Paratransit Program This program is for people who have a disabilit y, which prevents them from using a lift equipped Metro bus. There is no income limit. People registered under ADA Paratransit can use ACCESS transportation van service in all areas, on days and times Metro buses operate. Riders can bring a personal care atten- dant, if they are unable to use ACCESS transpor tation alone. They can also bring at least one friend on any trip. Reservations for ACCESS transportation van service can be made up to one week in advance. Call 206-205-5000. Metro fare is $1.75 per ride.